This illustrated primer on philosophy is a great way to be introduced to a complex topic. In her easily accessible style, Margreet de Heer visualizes the history of Western philosophy and makes it approachable for those with little knowledge of the subject. The book explains the thoughts of philosophers such as Socrates, Plato, Aristotle, Descartes, Spinoza, and Nietzsche, This illustrated primer on philosophy is a great way to be introduced to a complex topic. 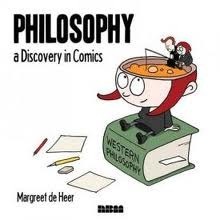 In her easily accessible style, Margreet de Heer visualizes the history of Western philosophy and makes it approachable for those with little knowledge of the subject. The book explains the thoughts of philosophers such as Socrates, Plato, Aristotle, Descartes, Spinoza, and Nietzsche, and ponders questions such as What is thinking? What is reality? Is there free will? and Why are these ideas still important? A perfect introduction to exploring philosophical concepts, this humorous yet substantive graphic account strips the subject of unnecessary complexity.